“A heavy responsibility was placed our shoulders," says Yesh Atid chairman after exit polls predict he'll lead the second largest party. Yesh Atid (Future) chairman Yair Lapid, who can definitely be called “the surprise of the 2013 election”, spoke on Tuesday night of the “great responsibility” associated with being the Knesset’s second largest party. 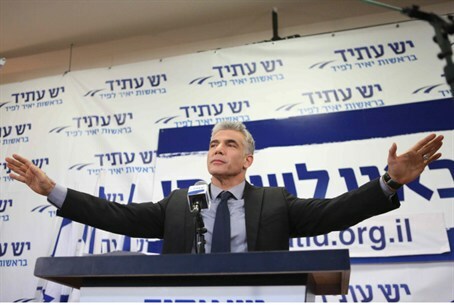 Exit polls have predicted that Yesh Atid will surpass all its achievements in previous polls and will receive 18 to 19 seats, behind the Likud Beytenu with anywhere from 31 to 33. With his party being the second largest, it is widely speculated that Prime Minister Binyamin Netanyahu will turn to Lapid and ask him to be a senior partner in his new coalition. In his victory speech on Tuesday night, which ironically was made at the same time as Lapid was speaking, Netanyahu indicated that one of the principles of his new government would be promoting equal sharing of the burden. Lapid has advocated for this throughout his campaign.